Caps - With identical twins you have to do certain things to make sure you know which baby is which within a split second. For a while now, we have a rule that if there's a blue option then it goes to Harry. "Harry Blue". All the family knows this too. These Gap caps are not only adorably cute, but it's perfect that they come in Navy and Red. You'll see them appear lots on our Instagram feed! 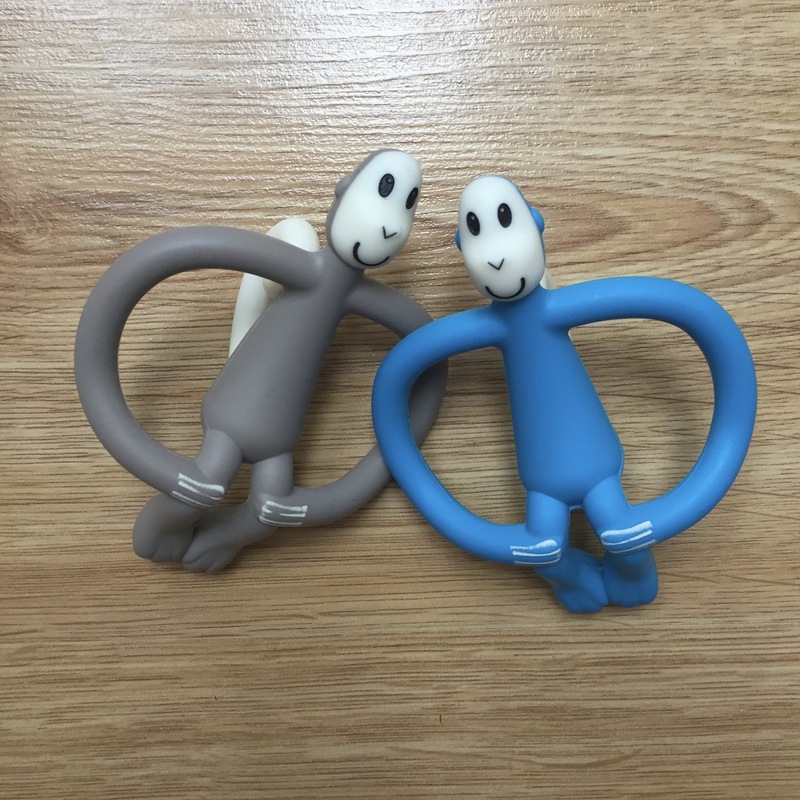 Matchstick Monkey Teether - For quite a while we've thought the boys were teething, but within this month they have both gained 6 teeth, and the other 2 visible..*Oh the sleepless nights, and miserable days! * They were brought these teethers by their Granny (GG) at Christmas. She picked them up at JoJo Maman Bebe. These things have gone EVERYWHERE with us ever since. 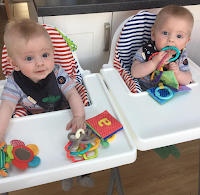 They easily clip onto the baby links, so they can have safely attached to their buggy, carseat, highchair.... And whilst they are sleeping I have to sneak them away just to wash and sterilise them! 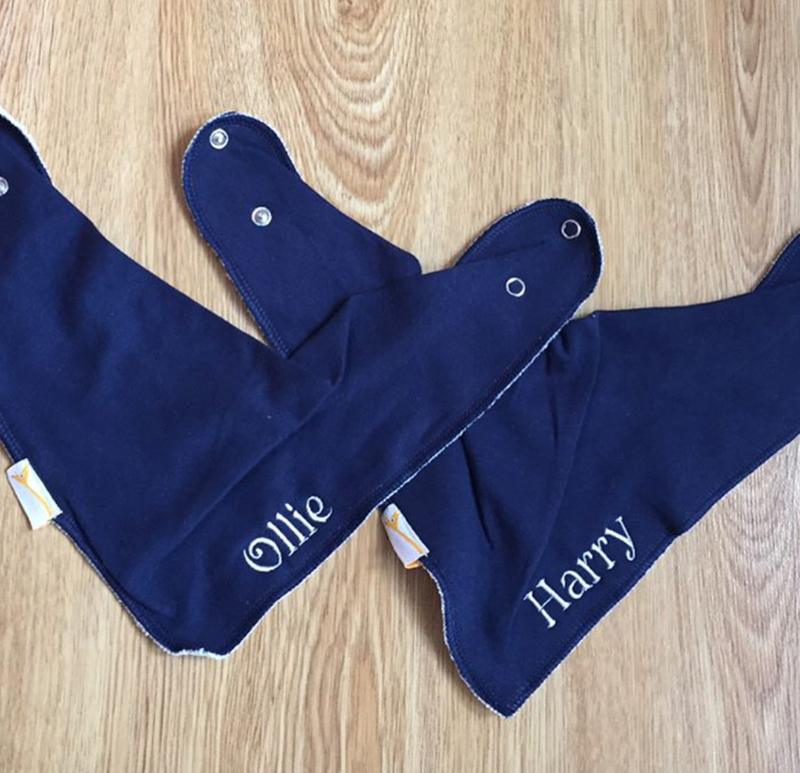 Of course they also came in different colours so "Harry Blue" & "Ollie Grey". Dribble bibs - I don't think we could do a favourites without a little shout out to Funky Giraffe. 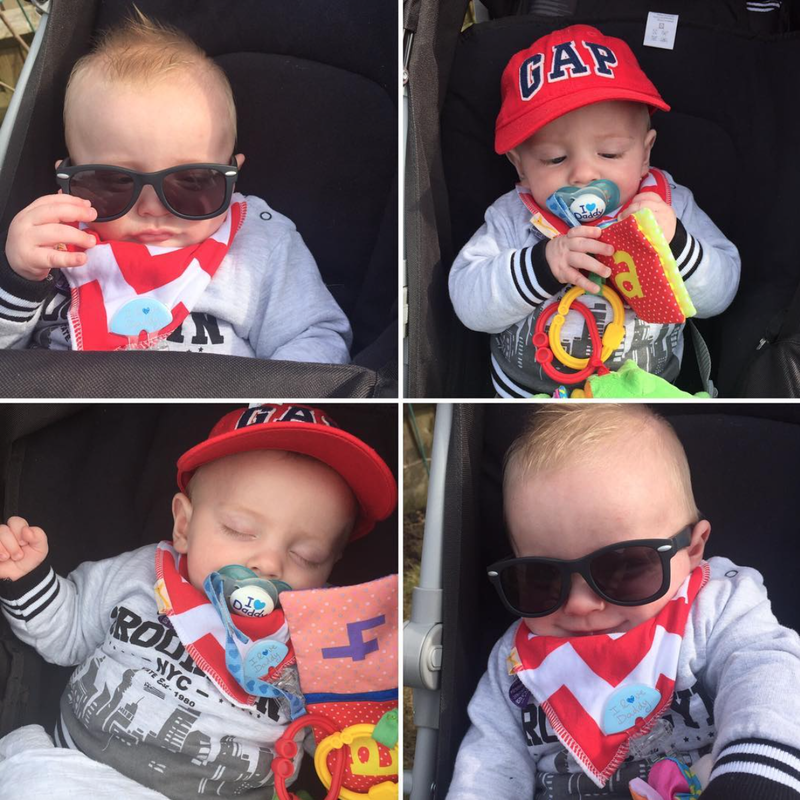 They are really absorbent, especially with our teething dribbles this month! They are very affordable, and the more you buy, the cheaper they get. It's very easy to get carried away! The camouflage pattern was my favourite until I had personalised ones made! They are fabulous! I was expecting it to be an iron on transfer, but it's actually been stitched on. I'll definitely be ordering some for their first birthday! I was also after something spring like and came across a gorgeous pattern from TinyTotTribe and they were perfect. Charlotte provides a quality handmade product and a fast service! I will definitely order from her again. She makes beautiful leggings and shorts too. 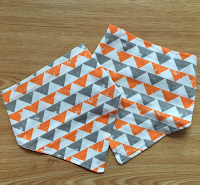 I have my eye on the monochrome grey tribal leggings! I just need to sweet talk the hubby😚..that's the issue with having twins, double the expense! 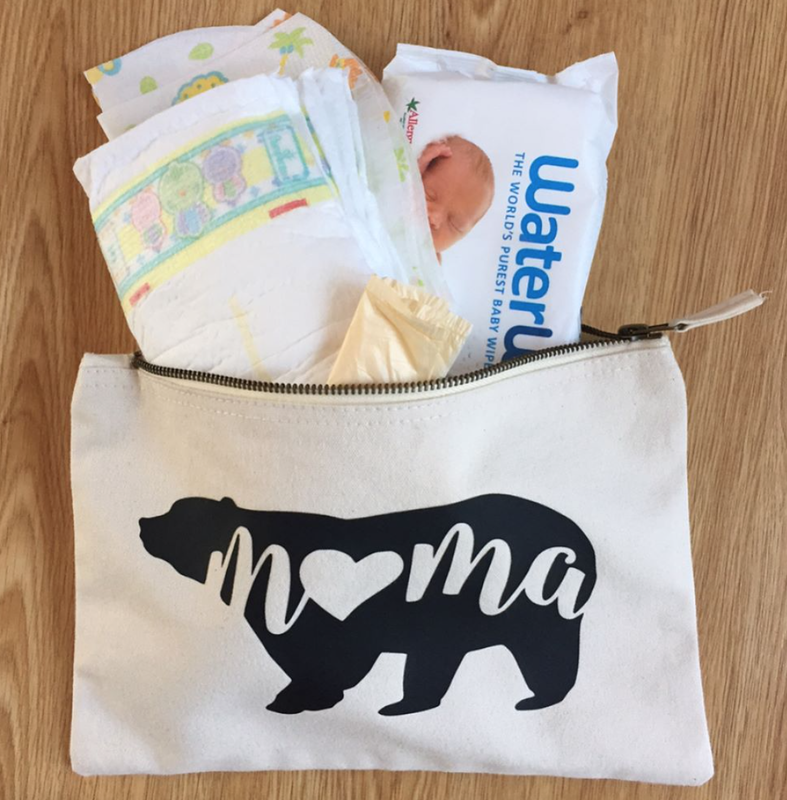 Mama Bear Pouch - I love the unique things being sold on Instagram by small local sellers. PolkadotPrinting were selling a cosmetic bag with Mother's Day in mind, but I found an alternative use for it. 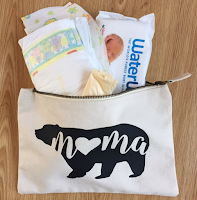 A grab changing bag. It has already been so handy. I stuff it in my handbag, when I don't want to lug around the big Skip Hop changing bag. It's really great for clinic days, when you've already got to take the red books along with you. Tranquil Turtle - My Godmother brought this as a gift from Tiny Herts, and with putting the boys in their own room this month it has truly come into its own! I had heard good things already, but the projector is AMAZING, and the sound effects are so calming. I pop it on before carrying the boys into their room. I don't have any fussing from them at all. I also enjoy listening to it on the other end of the monitor too! Then when they wake in the night, I pop it on and they go back off to sleep. Tommee Tippee Beakers - I attended a weaning class, put on by our health visiting service. They recommend that children aren't given 'non-spill' type beakers, until they are much older. Unfortunately I'd already purchased some, so I was looking for something inexpensive for the meantime. These are just £1.25 at Asda. What an absolute steal! 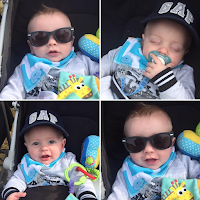 The boys love the independence of holding them, and actually like playing with them more than their toys! It's just unfortunate that they leak all over the floor!🙈 Again we have a couple of blue ones and a couple of red ones. 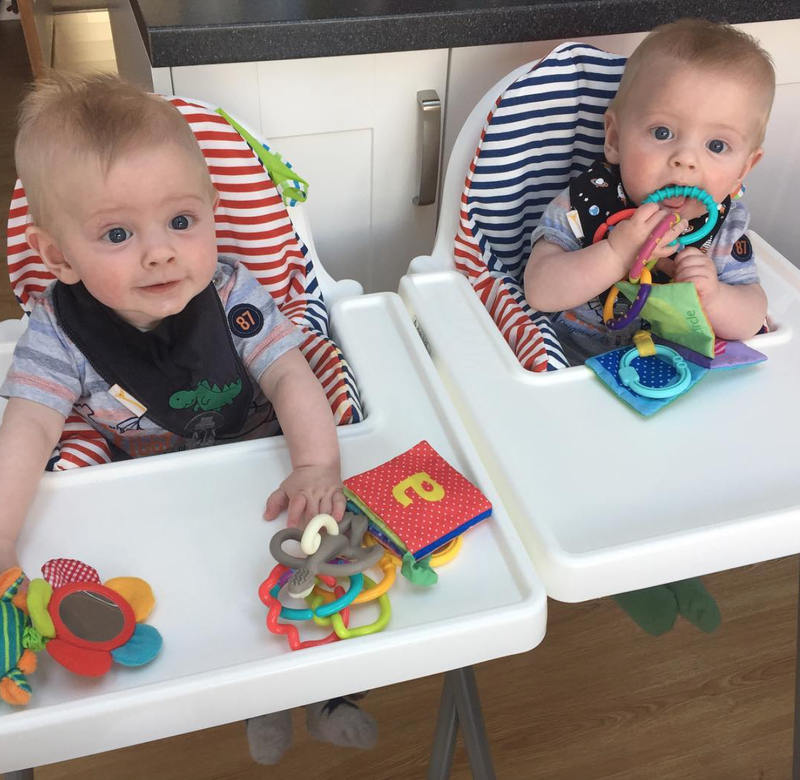 Highchairs - Our house is small so I was reluctant to buy actual highchairs, so initially purchased travel ones for Mamas and Papas. I didn't find them supportive enough for the boys yet, so we brought the Ikea ones as well. We also brought the supporting cushion and they are the best. The boys love being up the table with us, and they are really secure and supported. They are easy to clean. Even the insert has a removable, washable cover. And when it's not feeding times, they stack on top of each other! Activity Bouncer - Brought less than half price at Argos. They love it. They've always been keen to stand up and a bouncer, so this is ideal. Of course they fight over it, and if I put one in it, the other whinges! If I had the space I would have brought two, but it's just impossible to have so many obstacles around. Although I must add, they certainly aren'y as big as others on the market! Yep, I said it🙈. Although I'm ridiculously thankful for my beautiful boys, it truly was a means to an end for me. Carrying MCDA twins not only put a massive physical strain on my body, but I don't think anyone can prepare you for the emotional journey you have to endeavour. I had morning, noon and night sickness and nausea. They tried anti-sickness meds, but nothing worked. I had not one craving! I just wanted bland, as I knew I'd see it again within the hour😷. Plus I had to give up my favourite lunch, Subway's BMT as it contained cured meats😢! 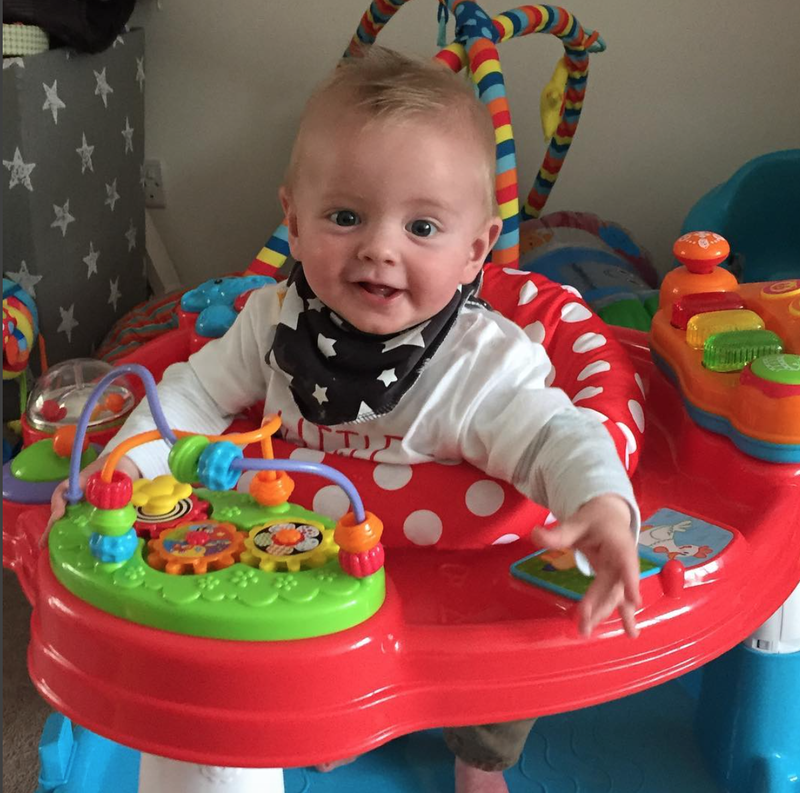 At 16 weeks, I didn't weigh anymore than before I was pregnant! They said that pregnant women are less likely to suffer with their usual aliments👍WELL THEY WERE WRONG😡! I had horrendous hayfever, eczema, IBS.... Plus to add to that the horrendous back pain, the little buggers actually cracked one of my ribs from lack of room (I'm 5ft1), a swollen EVERYTHING, anaemia (the damn parasites) which the hospital couldn't get under control until I was so constipated I thought I was likely to explode sh*t and babies. And then there's the injections in your bum for their lung development😩OH MY GOODNESS. I guess I went in thinking it would be like any other injection I'd had, but it felt like someone kicked me in the arse! Then you have to return to the hospital the following day to go through it all over again, this time knowing exactly what you're in for! Thankfully the second midwife was a little more gentle, or my inconsolable crying numbed the pain😝? But then there's the emotional side. 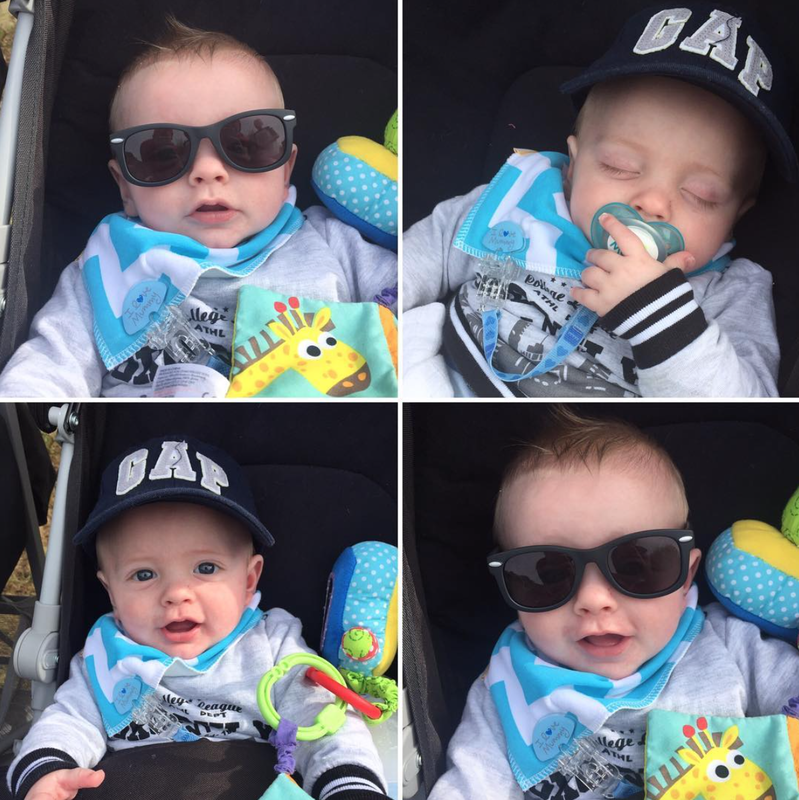 At 6.5 weeks pregnant, we were already advised that we were high risk, and that we would have to go under a consultant. Of course, my husband did some research and read up all about TTTS. I vowed to never read a thing, and asked no-one to tell me. I knew by my husbands stance of buying things, and announcing it to friends and family the outlook must be bad. We didn't announce it to anyone until I was 18 weeks, and we couldn't hide it anymore. I could tell when others around me read up the same information. They didn't say anything, but they just looked and spoke about my pregnancy differently. The consultant every fortnight would be very frank, and sugarcoated nothing! I could tell by his expression at the last few scans, that he was deeply astonished by the similarity in size. I think with everyone preparing us for bad news, it meant I never let myself truly believe that I would actually be a mum. It took from my waters breaking, to a couple of days with them to actually come to terms with it. Whilst they were in special care, and I was on the ward recovering from the c-section, and I remember waking up from naps and looking down at my tummy thinking "was that a dream, or did we do this?" I can't say I never want anymore children, but I can say it was the worst and best 7 months of my life💙💙!